This song was inspired by a BBC documentary I watched a few years ago called ‘How The Beatles Rocked The Kremlin‘. 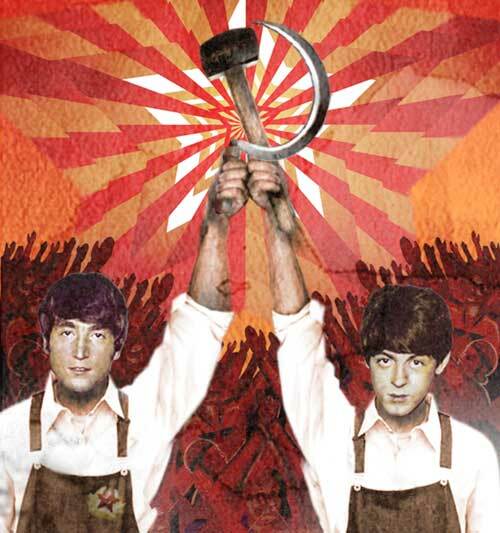 It told the story of how, despite being banned from the former Soviet Union, the Fab Four’s music still managed to find it’s way on to the turntables of the oppressed masses – causing a minor musical revolution in the process. So desperate were the Soviet youth to hear pop music – in particular Rock and Roll and The Beatles – that they took huge risks to obtain recordings and continued to find more innovative ways to smuggle in the music. The method that most captured my imagination was using old X-ray film to make home-made vinyl. The flexible records were then sold by dealers who hid the X-rays, or ‘ribs’ as they became known, inside their coat sleeves. The penalties for being caught buying or selling the forbidden tunes were considerable – including public humiliation and in many cases prison. It was a fascinating story and I’m considering using some of the history as the backdrop for a future novel or story. You can listen to The Wry Dogs recording of the song by clicking here. I’ve got to get my fix, got to get my disc. Policemen try to stop me, they insist. But search and ye will find. We make our own guitars and play! But come with me, cause there’s another way. I think the Russian story is just one example of how music can be such a powerful force of change and inspire even the most oppressed individuals. How important is music to you? Do you believe it has the power to light the very darkest places and make a real difference to lives? This was my 24th post for the A-Z Blog Challenge. Follow the blog during April for more writing tips, inspirational life posts, short fiction, film-inspired articles and more songs with audio recordings. Next post – Y is for You’ll have to wait and see! It’s a long time since we were on the point of change with music, I don’t enjoy very much from the last few years, and I don’t think anything or anyone has had an impact quite like the Beatles. This is interesting stuff, the song would have given hope at the time too. No you’re right Maria, The Beatles changed everything – although, it’s probably say that Elvis opened the door for them first, bringing that kind of music to the masses. The other thing I forgot to mention in the post is that it also motivated the young people to form their own bands, make their own instruments and amplifiers and all so they could play Rock n Roll. Amazing determination and courage. Fascinating. I haven’t seen this documentary, but it’s definitely on my list now. What an amazing thing, those kids being willing to risk prison for music. Now that’s inspiring. And, yes, I do believe that music has the power to light up the darkest places and make a difference. I don’t think it’s any coincidence that musical freedom is one of the things that gets trampled in totalitarian regimes–music can be such an accessible, contagious form of rebellion. Very happy-making post, and I like the song, too. Thank you, Kern. If nothing else, Music has the power to temporarily remove you from your immediate surroundings or situation. Reading great literature can also have the same effect. Great lyrics, fascinating post, I didn’t know that. It’s important we remember what things people end up controling on our behalf if we’re not careful. Very true, Lynne. I think we take for granted the huge freedoms we have in our democracies. A great inspiration for a song. I hadn’t heard this story before, but it does make me greatful to live where and when I live.